Magician claims my 970 EVO and 860 EVO are "not supported"
I just installed both a 970 EVO (Nvme) and 860 EVO (SATA). 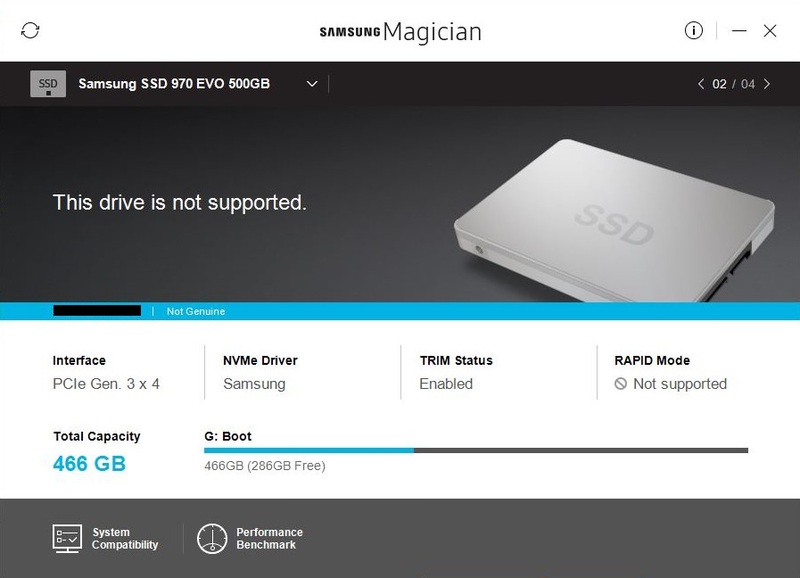 For both, Magician says "This drive is not supported" even though it correct reports they are 970 and 860 EVOs. I am running an up-to-date version of Windows 10. It is a Gigabyte Z170 Gaming 7 motherboard. It has the latest BIOS, and I've installed the latest drivers for everything, including the Samsung NVMe 3.0 driver. (I completely uninstalled both Magician and the older NVMe driver, rebooted, installed the newer driver, rebooted, reinstalled Magician, and rebooted. Did not help.) I am running Magician 5.2.1. I have disabled all firewalls, anti-virus, and other related programs. I am fully connected to the internet (obviously). Re: Magician claims my 970 EVO and 860 EVO are "not supported"
Can you please provide a screenshot of the Magican and your error? We would also like to know the version of your current SATA controller driver. This information can usually be found within the windows device manager under the catagories that say "storage spaces controller" or "IDE ATA/ATAPI controllers". Please take a screenshot of the drivers shown and driver dates if you would like further troubleshooting. i have the same issue exactly. Did you ever find how to fix it?